Lianas—woody vines, including grapes—are structural parasites. Climbing on their hosts to get to the sunlight means lianas can spend less energy supporting themselves, devoting more to producing leaves and fruit. The risk is that their wood is less robust to stress, like freezing cold temperatures. As the water in the plant’s veins gets cold, air bubbles form, which can mean death. Temperate lianas such as grapes have various adaptations to deal with the cold, including an ability to generate positive root water pressure: in the spring, pruned grapes will drip or even erupt water from their root stock, which helps clear the veins of possible air bubbles. In the field, stem water potential can be measured using electric probes, but it is difficult and time consuming. 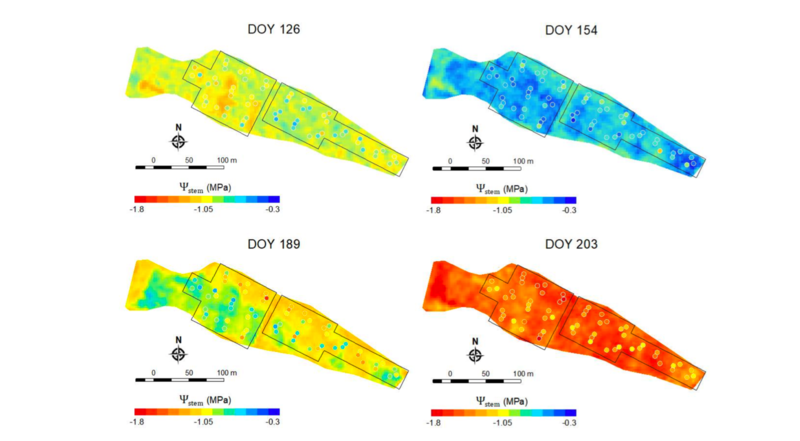 Leveraging satellite imagery could make those field measurements more efficient, allowing stem water potential to be estimated over larger areas and over different time periods. The full paper is available via open access from the journal Remote Sensing. David Helman and his team of Israeli researchers used a combination of field measurements and Planet Dove images to produce estimates of stem water potential for commercial vineyards. Effective management of water stress is among the greatest challenges in viticulture, and enabling it from space could improve efficiency in irrigation and fertilizer application.